The US economy contracted for four consecutive quarters since October 2008, something we have not seen since the Great Depression. A V-shaped recovery is simply not in the cards because the credit crisis has caused deep, systemic damage. Having said that, if the recession ends this year, it certainly won’t be because the global economy is healthy. Bank of Canada Governor John Carney and US Federal Reserve Chairman Ben Bernanke are proudly predicting that GDP will turn positive later in 2009, but much of that growth will be the result of trillions of dollars of government spending. There is only one politically acceptable way to pay for those trillions, and that is to expand the money supply at an explosive rate. That is exactly what the US Federal Reserve has been doing for the past year. But history and economics tell us that rapid increases in the money supply spell big trouble for investors because they set the stage for spiralling inflation. Here are four big reasons to worry about inflation. The inflationary implications of this action are obvious, but what is not so obvious is why they need to do it. The US economy has not been healthy for many years. A series of Fed-induced asset bubbles have masked a sobering reality: the lack of real economic growth. The toxicity in the system as a result of years of fiscal and monetary irresponsibility has not been washed away by this crisis, and if anything it has increased. The US economy’s structural imbalances remain, and misplaced monetary policy is allowing them to fester and multiply. Once the banks start lending the money that they’re now keeping as reserves, money velocity will reverse course and accelerate rapidly, prompting economists such as Lawrence Kotlikoff to warn that US money supply will likely triple in size by the end of this year. It will be very hard for the Fed to put the lid on inflation if that happens. Virtually every government in the world has taken the easy way out. In a recent issue of Atlantic Monthly, former IMF economist Simon Johnson expressed concern that the bankers and financiers who played the central role in creating the crisis are now using their influence “to prevent precisely the sorts of reforms that are needed.” What’s worse, the government seems helpless, or unwilling, to act against them. Canada’s budget surplus has turned into a multi-billion dollar deficit as a result of the credit crisis. But Canada’s problems pale in comparison to those of its neighbour to the south. The richest country in the world is drowning in debt. Let’s examine for a moment the sorry state of US indebtedness. 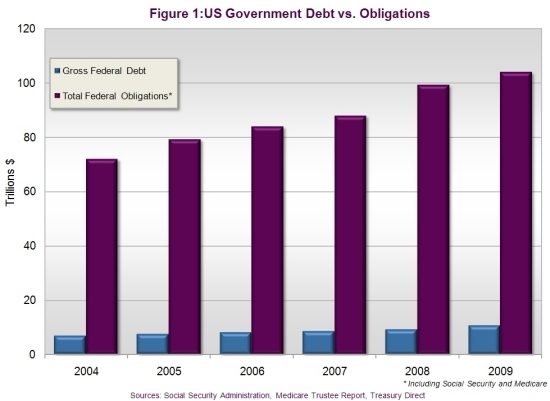 Due to ongoing bailouts and stimulus packages, the US will experience a record $1.75 trillion deficit in 2009. US debt (accumulated deficits), as tracked by the famous US National Debt Clock in Manhattan, stands at a staggering $11.8 trillion and counting. In 2008 alone, the government paid a staggering $451 billion in interest, according to the government’s own website, TreasuryDirect.gov. And that number is expected to rise substantially in 2009. That figure - $11.8 trillion - is a mindboggling amount of money. But it represents only a part of America’s total liabilities. If Social Security and Medicare obligations are included (which they should be), obligations rise to over $106 trillion dollars, according to the US Treasury. None of this money has been set aside, but has instead been borrowed by the government for its own use. When combined with the debt of nearly $11.8 trillion, total debt soars to an astonishing $118.6 trillion, or nearly ten times total GDP, or $300,000 per person. Former US Treasury Secretary Henry Paulson warned about this problem just last year, noting that it “will drive government spending to unprecedented levels, consume nearly all projected federal revenues and threaten America's future prosperity." Financial analyst Jim Puplava says the US government is funding Medicare with Medicare Trust bills. There is only one problem: there is nothing actually backing those bonds. Since the government will shy away from raising taxes, the answer will be to print yet more money out of thin air. America’s massive debt and unfunded liabilities make inflation the only viable option for today’s policymakers. Why? Because when the value of future dollars is diminished, future obligations in those depreciated dollars are diminished. Investors are not just facing a future of uncomfortably high inflation; they may be facing hyperinflation if the US dollar loses its reserve currency status. Raising taxes to pay for the bailouts is political suicide, but printing money is not. Monetary authorities have done a good job of keeping investors in the dark, and they have had help from a surprising source: the media. The overprinting of money, as Chris Martenson points out on his website (www.ChrisMartenson.com), is “never discussed by the US financial mainstream press and therefore goes undetected by the majority of people.” Money printing may be the ultimate stealth monetary policy tool, but it has lethal consequences. Even famed stock investor Warren Buffett has become concerned about inflation. In March of this year, Buffett expressed concern that stimulus efforts may lead to an inflation exceeding that of the 1970s. These are not idle remarks; they emanate from one of Obama’s own (unofficial) economic advisors. Buffett knows that when massive money printing is combined with bloated government debt, it makes it exceedingly difficult for any central bank to raise interest rates. 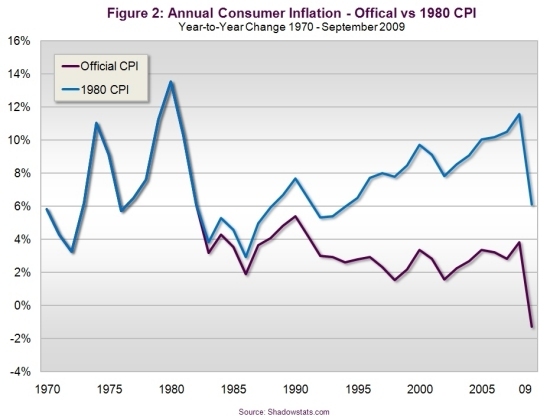 And yet, as the early 1980s so painfully taught us, that is the only policy measure that can contain inflation. The US government and Federal Reserve are caught in a fiscal and monetary bind of their own creation. 1) Zero percent interest rates are having minimal impact on growth, yet 2) with the exception of one or two quarters, prices of goods and services are still rising. 3) Rates must rise to contain inflation when it heats up, but 4) massive and growing US debt will make it nearly impossible for policymakers to raise rates. In both Canada and the US, inflation is hurting our pocketbooks, but you wouldn’t know it from the Consumer Price Index (CPI). That’s because the CPI is understated by as much as 7 percent per year according to economist John Williams, who has been tracking US CPI for many years (see Figure 2). In addition, North American investors and consumers seldom hear the “headline” inflation number. Instead, the financial media usually report only the "core" inflation number, which excludes food and energy. This was done, ostensibly, to remove volatility from the CPI. But food and energy account for about 23 percent of consumer spending, so how can they be ignored? Governments have a major incentive to understate CPI because trillions of dollars’ worth of pension funds, health benefits and wage increases for public sector employees are indexed to it. Today’s CPI is substantially understated because it is calculated using a complex re-weighting formula that is riddled with substitutions, exclusions, hedonic adjustments and geometric weighting. If we were to recreate the CPI using the original 1983 formula, we would discover that even though we have experienced asset depreciation following the credit crisis, price inflation for goods and services has not gone away. And if the monetary authorities had decided to factor home prices into the CPI, the bubble would have been far more obvious from the beginning. Intelligent investment decisions can’t be made without knowing the true rate of inflation. In a world where savings rates currently average 1 percent, an inflation rate of just 2 percent is a guaranteed loss. There is nothing that governments are better at than debasing their own currency. The Canadian and US dollar have lost more than 80 percent of their value since 1970. Again, this is reflective of a concerted monetary policy that continuously drives excessive growth in the money supply. When a country’s money supply is increased faster than its rate of economic growth, the purchasing power of that country’s currency declines and prices rise. For more information on the real CPI rate, visit www.shadowstats.com. The world’s central banks are printing money and running deficits. As for America, the world’s largest economy is massively in debt, its unfunded liabilities are approaching $106 trillion, its spending is out of control, there is explosive growth in its money supply, and its official CPI is blatantly distorted. All this would be more than enough to spark dramatic inflation, but there is also another inflationary factor we must deal with: Peak Oil. Peak Oil is not someone’s pet theory. It is not a rumour spread by left-leaning conservationists. Peak Oil is supported by hard production data. Peak Oil is a field-by-field extrapolation of what has already happened to existing oil fields. As most investors know, the US has had to import ever-increasing amounts of oil as their own supplies have decreased. But now, the exact same thing is happening in Britain’s North Sea and in Mexico. Oil is a finite resource, and many of the world’s largest oil fields are being rapidly depleted. The maximum rate of global petroleum extraction has peaked, and now the rate of production is entering terminal decline. The reason for the decline is, to a large extent, the lack of new discoveries. Most of the major discoveries were made in the 1950s and 1960s. Since then, the annual discoveries of oil have kept dropping to the point where, when we take oil out, we do not replace the reserves. While it is true that as more wells are drilled and newer and better technology is installed, production initially increases, eventually a peak output is reached and oil production not only begins to decline but also becomes less cost effective. At some point in this decline, the energy it takes to extract, transport and refine a barrel of oil exceeds the energy contained in that barrel of oil. This is happening now. Simply put, the world is quickly running out of cheap oil. Years ago, Nobel-Prize winning economist Milton Friedman explained that global inflation was a monetary phenomenon that was subject to external shocks and to unpredictable time lags. Soaring oil prices are an external shock just waiting to happen to the monetary system. Because oil is such a vital component of so many products and services we consume, higher oil prices mean higher prices for nearly everything, not just now but over the long term. Oil is unique, more like a currency than a commodity. The price of oil directly affects the price of the Canadian and Australian dollars. It is the lifeblood of business productivity and essential to our everyday life. It is the reason America’s foreign policy designates certain areas of the world as strategic, but not others. Although Canada is a net exporter of oil, it is not energy independent. Canada imports significant quantities of energy from the US and Europe. At the same time, the Canadian and US markets for petroleum products are deeply integrated, so supply problems in the US affect not only American consumers but Canadian consumers as well. High oil prices were forgotten when oil prices declined from $147 per barrel to a low of $30 per barrel. However, prices have rapidly risen back up to $70+ per barrel, and are poised to rise much higher. US oil production peaked in 1986, Alaskan production in 1990 and North Sea production in 2000. Global oil production is believed to have peaked in 2008. The US is the world’s biggest oil importer, but global demand is growing rapidly, particularly in India and China. Between 2003 and 2007 China’s oil demand grew at nine times the US rate. Meanwhile, in India, less than 1 percent now own cars but sales are growing at a rate of 20 percent per year. At the same time, many countries that were exporters are retaining a greater and greater percentage of their oil for their own burgeoning consumption needs, so they have far less to export. The International Energy Agency (IEA) estimates that three more Saudi Arabias will have to be found and brought on stream just to meet the needs of China and India. The clearest example of collapsing oil production is Mexico’s Cantarell field, the largest oil field in the Western World. From over two million barrels per day in 2004-2005, Cantarell now produces only 700,000 barrels per day. Soon Mexico will itself become an oil importer – no longer the third-largest exporter to the US. It is projected that in the next few years Mexico will become a net importer rather than an exporter of oil. As a result, the US will lose its third-largest supplier. Jeff Rubin, for more than 20 years the chief economist at CIBC World Markets, makes a compelling case for oil to soon rise to $225. “It's not that the world is running out of oil in an absolute geological sense,” he says, “but it is running out of the type of oil you and I can afford to fill your tank with.” In his recently published book, Why Your World Is About to Get a Whole Lot Smaller, he writes that a world that was built on cheap oil is about to go through a radical transformation because of high oil prices. The debate is no longer about whether costs will rise. The debate is about how society will react and cope, because the economic, social and political costs of Peak Oil will be unprecedented. Pouring money into everything that moves may end one crisis but it will surely jumpstart another far more damaging one for investors. Despite Ben Bernanke’s protestations, the money supply spigot cannot simply be turned off when inflation starts to heat up because there is a 12- to 18-month time lag between monetary policy implementation and its effect. Investors who believe we are living in a deflationary period should ask themselves a simple question: why are grocery prices and gas prices and hairdressing prices and insurance costs continuing to rise? What investors fail to understand is that price deflation is very different from asset depreciation. Asset depreciation (stock and real estate prices falling) has a negative wealth effect, but no effect on purchasing power. Price deflation, on the other hand, has a positive purchasing power effect. None of us can say our purchasing power is increasing, despite the recent negative CPI numbers. Price deflation is nowhere to be seen at this point. Since 1971, when the world went to a pure fiat monetary system controlled by central banks, currency in all countries has lost purchasing power. In Canada and the US it is down over 80 percent. Today’s massive and still rising unemployment will do little to dampen the inflation fires, because inflation is never caused by too much demand but rather by too much money in the system. To paraphrase the late, great economist Milton Friedman, inflation is always and everywhere a loose monetary policy phenomenon. As the stagflation era of the 1970s clearly demonstrated, if slow growth could tame inflation, we would not have suffered through years of high inflation and low growth. Inflation hurts stock prices because inflation increases volatility and uncertainty and risk, which makes businesses more risk averse, which reduces profits, which reduces price/earnings multiples. And lower P/Es always lead to lower stock prices. It is difficult to determine exactly where we are in the recovery process. That’s why the money spigot can’t be easily shut off. Too little money and a nascent recovery could be choked off. Too much money, and inflation will be impossible to control. If virtually all of the world’s brightest financial minds missed the telltale warning signs of a bursting credit bubble in 2008, why should we believe they have any more insight into a recovery now? For investors, it is not a question of if but when inflation will arrive. Fortunately, there is a solution to the inflation problem: an asset class that offers proven protection against every kind of inflation. I will introduce this asset class in Part 2: How to inflation-proof your portfolio.